As I started writing this, I was flying along merrily in the airplane, with no crocheting to do. Hoping against hope there would be a knitting store near the hotel where I could obtain a size H crochet hook. Apparently I was not meant to get anything done on this trip after all. Except write up some advance blog entries, so I guess that is OK. I left the house in plenty of time to go to one of my favorite greasy spoons and have breakfast. At breakfast I realized I didn’t pack any knitting or crocheting for the plane, and I really needed to work on my Camp Loopy crochet baby blanket, so I went home and got it. And I am sure I got the hook, but somewhere along the line, it slipped out one of the holes at the top of the bag. I was sure there was still a possibility it was in my carry-on somewhere, I tore it apart to the best of my ability but a thorough search is not as possible in an airplane seat. So I was writing instead. If I just read my books, I would be done with both of them before we landed in Spokane and then I would have to buy a new one for the trip home. I arrived at the hotel, tore my carry-on apart, and no crochet hook. So I got on Google and found a really nice yarn store not too far away (1.6 miles according to mapquest) and asked my friend and board member S. if she wanted to take a walk. I did warn her how far it was. It was relatively cool here in Spokane compared to how hot it has been in Colorado, so off we went. Well, we had to divert a little because one of the bridges Mapquest had us crossing was cars only, but it wasn’t too bad. It seemed a lot longer than 1.6 miles however. Eventually, though, we arrived at Paradise Fibers. I had called them to make sure they were open. They had apparently had a run on size H crochet hooks, however, and we kind of had to scour the store – all of the typical ones were depleted. They were very helpful in the search. Finally, we found one that was usually used for Tunisian crochet, but I thought it looked a little big, so I also picked up a size G. Right before I was ready to check out, though, S. found a “Reflections Crochet Gift Set” which contained a H hook, so I decided to get that. As well as a lovely lavender Lantern Moon project bag, and a nice skein of red violet and green Frolicking Feet by Done Roving Yarns “Berry Bush” which I will use to make the Wingspan Shawl as soon as I have a few other projects done. So I guess I have my Spokane souvenirs. This store is staffed almost entirely by young, good-looking men. Kind of encourages you to come in and visit rather than shop on the internet. So this is where it gets really crazy. We asked one of the guys how we should get back to the falls on the river – he said he would get us a map, and then he came back and said, “You know what, it is a long way, why don’t I just give you a ride?” First he took us upstairs to the break room and let us have a glass of water, which was welcomed, and then he drove us to the riverside park. What kind of amazing customer service is that? His name was Travis and he is one of the owners of the store. I will be a loyal customer from now on, I can tell you that. Now if my nieces are reading this: NEVER ACCEPT RIDES FROM STRANGERS. But if you are my age, accepting a ride from a yarn store owner is probably pretty safe. More next time about our adventures at the park (shaved ice! Tram!) and our dinner that night. 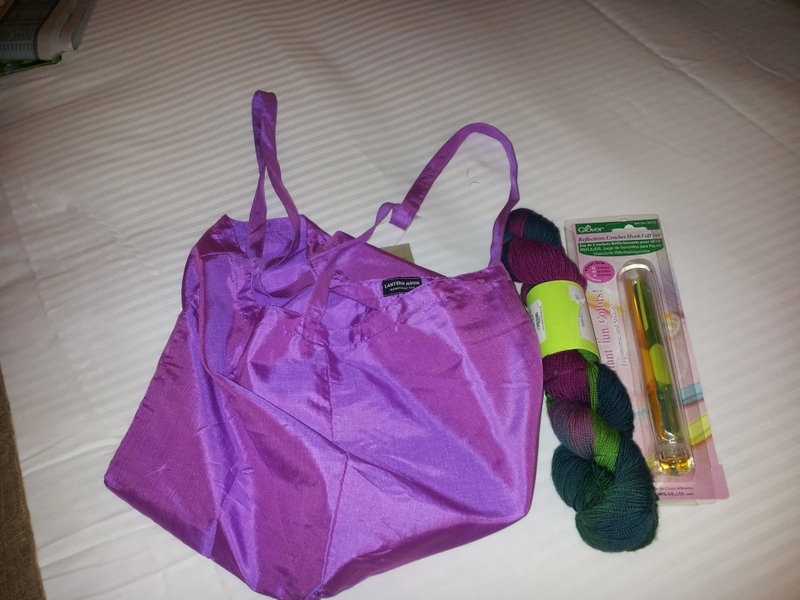 This entry was posted in Crafting, Crocheting, Spokane Trip Report by glenderella. Bookmark the permalink. Hmmm, do you get souvenirs for Ken, or does he share? Lovely bag! We got a free golf tee and frosted animal crackers in our meeting bags, so I think he will get those. Unless I get hungry, then he will get the golf tee. People in Spokane are really nice. So I would imagine that Spokane Yarn People would be even NICER!! I’m glad you were able to locate a hook. When do you write your blog because I stayed up till 2:00 in the morning because we went to see spiderman( excellent movie you should see it) and you still had not posted or do you wake up at like 5:00am like grandma and write the post like her diary? I usually write it the night before and set it to post at 6:00 a.m., I think Eastern time, so it would be 5:00 a.m. your time.